Texas Gov. 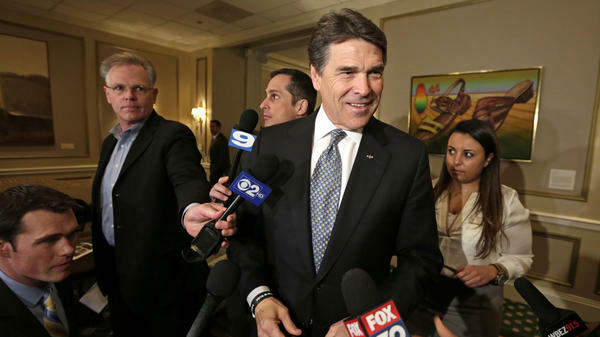 Rick Perry meets with Illinois media during his April trip to lure businesses. Gov. Rick Perry's outsized Texas swagger is coming to the heart of blue state America. As part of his ongoing effort to lure new business to the Lone Star State, next week the conservative Republican governor and former presidential candidate is taking his economic development road show to New York and Connecticut — two solidly Democratic states whose politics couldn't be any more different than Texas'. The visit follows earlier incursions this spring in two other noted Democratic strongholds, Illinois and California, where Perry also preached a low-tax, anti-regulation message that runs counter to the ethos of the dominant local political culture. So far, Perry's TexasOne team, a coalition of corporations and chambers of commerce, has launched $1 million worth of commercials on blue state TVs, blasting the slogan, "Texas is calling. Your opportunity awaits." It's an inviting — or disturbing — message, depending on your point of view. But Perry has never let mixed public reaction slow his roll. And he's on quite a roll lately, stoking the red-state-blue-state fires in an off-election year. "If you're the legislators [in those states], or the governor or the mayor, who are the reason for those regulations or taxes or lawsuits, then I'm suspecting there's going to be a little pushback," Perry said at a Monday press conference. Intrastate economic competition is not new, of course, but those in targeted states have called his efforts offensive and outright job poaching. Perry's cocksure style hasn't helped. Doug Whitley, the president of the Illinois Chamber of Commerce, said Perry came on too strong. "The biggest difference with Perry was, he was kind of like a Roman emperor coming into town with horns blowing in front of his arrival, his parade," Whitley told Politico this week. On its face, the expensive ad campaigns and personal trips are an effort to persuade businesses to expand or relocate their workers and offices to the Lone Star State. But it's hard not to notice the gamesmanship. Engaging in a public battle with blue states and irking Democrats there might be considered a clever political play — it's not as if he's alienating fellow Republican governors with his forays. And, after all, Perry built his once-rising national political profile on Texas' low-tax, low-regulation, lawsuit-limited environment as a strong incubator for jobs. "He's always been good at mixing a economic rationale with political rationale and this is no different," said Jim Henson, director of the Texas Politics Project at the University of Texas, Austin. "We can argue about how much credit he deserves [for Texas jobs] but he's eager to take credit for it, and this is part of that." During his four-day trip to the Northeast, he's likely to borrow the playbook from his recent brawls with California and Illinois. They rank 50th and 48th, respectively, in a survey of best states for business, according to a recent Wall Street Journal poll. In February, TexasOne purchased a reported $24,000 in radio ads in California urging businesses to move. "Building a business is tough, but I hear building a business in California is next to impossible," Perry said in the ad. California Democratic Gov. Jerry Brown fired back, saying it was no mystery why Perry would try to poach from California — because that's "where the gold is " — and noting that in the nation's most populous state, the size of the ad buy was "barely a fart." In Illinois, the Texas campaign included an ad with the message, "Get out while you still can" near an emergency exit door. Perry paid a personal visit in April and got a prickly reception from public officials. Democratic Gov. Pat Quinn called Perry a "big talker" and said, "We don't need any advice from Rick Perry." "This is not about bashing one state over another; it's about promoting competition, Texas and the economic climate we've created to encourage job creation and prosperity," Perry spokesman Josh Havens told The Dallas Morning News. It's unclear whether this campaign — or previous efforts — have actually begun to lure businesses from those states. Research from the Public Policy Institute of California shows that even with California's history of high taxes and heavy regulation, fewer than 2 percent of job losses between 1992 and 2006 were due to businesses leaving the state. Perry's office hasn't responded yet to a request for information about any new business resulting from the campaigns. But if nothing else, the latest national debate about intrastate competition has brought Perry a slew of headlines. And that can't hurt for someone who might want to erase — or at least blur — public memories of the 'Oops' heard 'round the world and rehabilitate his national profile. "You try to layer on new memories," said Henson. "It's not unlike a relationship gone bad or that has hit some difficulties. You try to create some good memories to outweigh the bad." Political watchers in Texas say he's playing both an inside and outside game. While he burnishes his national standing on the road by touting the state's fiscally conservative credentials, inside Texas, he's allowed for budget growth and spending that sits uncomfortably with the conservative base but wins over establishment Republicans. Republican leaders during this spring's legislative session have allowed a growth in state spending to pay for infrastructure, like water, and Perry committed to transportation funding by calling a currently ongoing special legislative session on the subject. "Perry is still able to say we were able to do all that without adding taxes, and that's a very appealing message," said The Dallas Morning News' senior political writer Wayne Slater. Perry has said that he'd make a decision later this summer about his future political plans, whether it's a second run for president or running for re-election as governor. In Texas, where he's already the longest-serving governor in state history, there are no term limits that would prevent him from an unprecedented fourth run for the office. With New Ads & Famous Friends, Perry Luring Jobs from NY, Conn.
Gov. Rick Perry is launching an ad campaign in Connecticut and New York, trying to lure businesses to the Lone Star State. The move comes after Gov. Perry made similar efforts in California and Illinois. But this time, Perry’s taking his message to television screens instead of radio. A Texas advocacy group took some less than subtle steps today to get a meeting with the governor. Members from the healthcare advocacy group Texas Organizing Project interrupted Gov. Rick Perry multiple times during a speech at the Texas Global Business Summit this afternoon, repeating a call for Texas to accept federal Medicaid dollars.